It’s hard to watch this video and not smile. 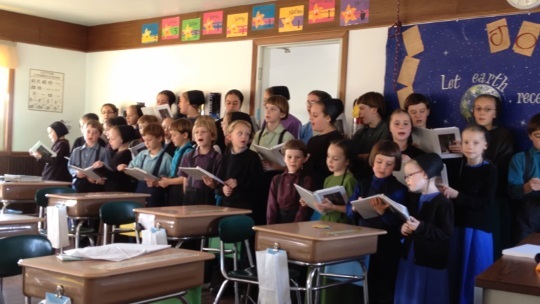 A class of Amish schoolchildren sings “The Ninety-Nine” for the camera in what looks to be a Holmes County, Ohio Amish school. So enjoy this sweet rendition of a 120-year-old hymn…and can you tell from the video why I guessed this to be that community? ’Twill perish there—how sad the sight! Upon the mountains bare and cold. We’ll seek that lamb and bring it home. Well, I know why you guessed Holmes County! 🙂 Fun to see some faces I recognize. Is the clue (to the children being from Holmes County) the style, and especially the color black, of the girls’ coverings? That’s right Al – I was basing it on the haircuts and prayer coverings of the children. You can see the different Swartzentruber-style coverings of a couple of the girls, and the one little boy has a classic Swartzentruber haircut. Some Amish schools in Holmes County will have a mix of children from the different affiliations. The haircuts & coverings stood out, but I have to admit I know the school and know it has always had a mixture, so “prior knowledge” and all that. The Children did very well with the "99"
Does the 100th get saved in the end? I well behaved class of pupils – it must be a pleasure to teach in AMISH Land. Couldn’t help noticing a well earned yawn towards the end ! Till I saw the adult women’s caps, sorry, bonnets, I thought — Indiana, Jay County or thereabouts. But to my recollection adult women wear black Kappe there. So not quite right for those settlements. Don’t know Holmes County garb. After a girl joins church, does her bonnet colour change there? How can I visit an Amish Community? Hello Erick. How can I apply for living in an Amish Community? Please ? Alex, the “bonnet” is the (usually black) outer piece of headwear worn over the cap, so you were right when you said “caps.” Most Amish bonnets are black, but there are a few communities that have brown and younger girls in PA communities often have blue ones. I don’t know of any community/ group where the cap changes color with baptism — it’s usually black for single girls at church, white for married at all times. During the week, it varies depending on group. There are Swiss Amish communities (like in Ind.) where all caps are black no matter if the person is married or single. The teachers are also from two different groups of Amish according to their dress code. Aha Katie, is that by the kapp – they look slightly different to me – or something with the dresses? I so enjoyed their singing this song. I noticed they were well mannered as they took their places to sing. I did not think they liked to be photographed. Would they have gotten parents permission to do this video? There are “Dan Amish” , Holmes OldOrder, Swartzentruber, and a New Order teacher. Black caps are generally the color for school girls everyday. They would wear white for dress up, except for church when all single girls wear black. Once you’re out of school that is the only time you wear black ( for church). My Canadian friends wear black all the time and the married women wear white. Thoroughly enjoyed this. I live 1/2 mile from an Amish school and often wonder as I drive past what might be going on in there. As for the song, I had it as an instrumental when I learned to play the organ as a young girl, but never heard the song or the words since. Thanks for sharing this with us today. Both a pleasure to listen to and share here. Thanks Carol, and glad you liked it.